Living in Britain during the mid-1990s gave me the opportunity to consider both the bloody history and current tactics of the Irish Republican Army. This extreme activist wing of the Roman Catholic minority in Northern Ireland used terrorism to try to force the British government to yield to its perverse will. From that time, the Trumpet has followed developments in Ireland closely. We observed, analyzed and wrote on the period known as “The Troubles” that ended with an ira/Sinn Fein declared cease-fire in 1997. We followed ira progress through the 1998 Good Friday Peace Agreement, the questionable path of the ira disarmament process, the experimenting with local administration in Northern Ireland, on up to the hiatus that Prime Minister Tony Blair declared in 2002, when he suspended local government in Northern Ireland over Irish Republican Army espionage activities. And we have kept a watchful eye on events in Northern Ireland since. The inevitable end of this process instigated by the anti-British Irish Republican Army in Northern Ireland. The tactics of terror have triumphed in Northern Ireland. Given the absolute inerrancy of biblical prophecy on the future of the British peoples, we are not surprised at this outcome. Terror was a reality in Britain decades before it hit the American continent. Over 3,600 souls have died in the terrorist warfare in Ireland over the past four decades, more than were slaughtered by Islamic extremist terrorists in the United States on 9/11. In fact, the Irish Republican Army is perhaps the longest-standing terror group of modern times, being the mentor of many terrorist cells that have evolved from the time of the Indian rebellions during the British Raj to the Islamic extremist terror that has swept the globe since the fall of Suez. Yet for all its mentoring of other multiple terrorist groups around the world, the ira has been slow in gaining a much-cherished goal accomplished by so many of its international apprentices, often with much less effort over shorter spans of time. That goal is to become a legitimate political force in the mainstream, gaining acceptance by established governments, the international community, and the public within their home states, and thus to win power by political means which they started out to gain by the tactics of terror. There’s no mindset change with these groups. Only a change in tactics. Africa has been the post-colonial example of the trend to forge publicly acceptable political imagery out of terrorist beginnings, from Jomo Kenyatta’s Kenyan Mau Mau to Nelson Mandela’s South African anc/Communist terror cells. In the Middle East, the Palestinian terrorist enterprise, the Palestinian Liberation Organization, having morphed into the politically acceptable Palestinian National Authority, is a current example of this trend. Terror groups in Latin America have also been part of the movement to gain political acceptability by timely changes from their terror ploys of perpetrating murder and mayhem to winning—or even buying—political support in the mainstream. The degree to which the ira has been involved in the drug- and gun-running circles that feed many of these terrorist enterprises is a matter of clearly documented fact. The Taliban in Afghanistan is another case in point. Achieving their ultimate goal of political power was largely possible because of the evolution of the language employed by the media, by the intelligentsia and by politicians in their description of terrorists, who, by their very nature, are intent on seizing power at any cost. The process by which terror groups increasingly achieve their political goals has become familiar. Kill and maim until sufficient terror has worn down opposition by force. Wear out resistance by unerring application of tactics that consider all—men, women, children, and even some of your own terrorist group’s members—as fair game to be sacrificed in pursuit of perverse political goals. Eventually you will reach the breaking point—the point at which the press, the public, and mainstream politicians yield, brainwashed through mass mind-conditioning into viewing the agents of terror as the oppressed of society that really deserve a break, especially from the “tyranny” of America, Britain and the Jews! Three classic photographs sum up the effectiveness of this process—and its inevitable results: the May 4, 1990, handshake of Nelson Mandela and President F.W. De Klerk of South Africa that started this once-great nation down the path toward the inevitable status of Robert Mugabe’s neighboring Zimbabwe; the handshake between petty terrorist Yasser Arafat and Israel’s Prime Minister Yitzhak Rabin on the White House lawn on Sept. 13, 1993, that started the embattled nation of Israel on the road to the ultimate partitioning of its homeland; and now, the most recent infamous photograph to yet hit the front pages in Britain this century, the photographic portrayal, minus handshake, between Ian Paisley and ira/Sinn Fein terrorist head Gerry Adams, on March 27, that will end with a Catholic takeover of Northern Ireland once Paisley fades from the scene. Though it has been slow in coming—as it followed the terrorists’ bloody and tortuous path to its ultimate objective—the ira, via its publicly acceptable political wing, Sinn Fein, has finally gained legitimacy as a recognized political force in Northern Ireland. On March 27, newspapers in Britain carried front-page photographs of Ireland’s Democratic Unionist leader, the conservative, anti-Catholic Ian Paisley, sitting at a diamond-shaped conference table with Gerry Adams, being interviewed by the media. The occasion was the first-ever meeting between Paisley and Adams following decades of acrimony between the two and their respective parties. Paisley and Adams agreed to form a joint administration for the province of Northern Ireland, hotbed of hatred between Protestant and Catholic. If this deal does eventually come off, and a joint administration between Northern Ireland’s largest political party, the protestant Democratic Unionists, and its most militaristic—Catholic Sinn Fein—does survive, it will be a clear victory for ira/Sinn Fein. That’s tantamount to another victory for terror! And the Vatican! Despite the fact that Paisley was sworn in on May 8 as first minister of the Northern Ireland administration with Adams’s underling, Martin McGuinness, as deputy, in reality this represents a huge backdown by the Democratic Unionist leader. There has to be a reason why Adams was grinning like a Cheshire cat in those photographs published on March 27 and his political opponent not even managing a twitch at the corners of his mouth. Paisley, long the rabidly anti-Vatican voice for a non-Catholic province of Northern Ireland, is now at risk of yielding to a compromise that once was thought an impossibility: not only doing a deal with a terrorist leader, but also creating the avenue for the political and religious entrenchment of the very process against which he has for so long fought, the inevitable catholicization of Northern Ireland. That Paisley is now reconciled to his capitulation to the tyranny of terror may have well been reflected in the vision portrayed by another front-page photograph that appeared on the occasion of a visit to Northern Ireland on May 1 by EU Commission President Manuel Barroso. In that photograph, sitting with Barroso and McGuinness to his immediate right, the old Protestant war horse is seen absolutely beaming! As the Times mused, “[F]or the skeptics there could be no more astonishing evidence than to see … Paisley and Martin McGuinness beaming genially at one another and laughing at each other’s jokes. 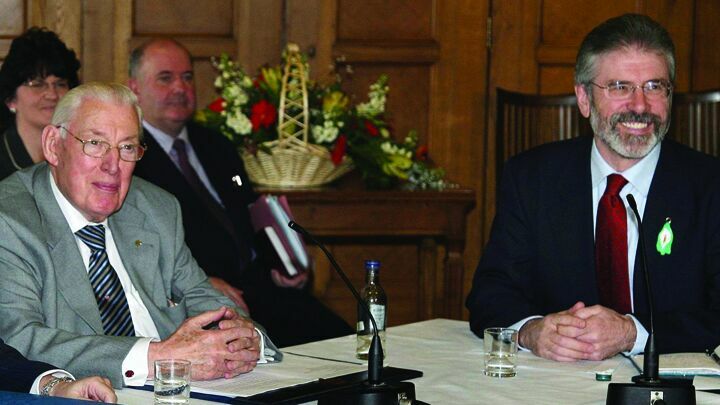 The occasion for the first official engagement of these former sworn enemies was a visit by José Manuel Barroso, the European Commission President, to Stormont” (May 2). Any serious long-time observers of Northern Ireland must have shaken their heads in disbelief at this charade. The Times meekly observed, “But perhaps it was first-date nerves which gave this first public outing a note of hilarity verging on hysteria as the former gunman and the former tub-thumper went out of their way to appreciate one another’s company” (ibid.). Well, there’s more to it than that. Ian Paisley should have been mindful of Barroso’s Trojan horse. Barroso left his wooden horse at Northern Ireland’s door, pledging EU financial grants should the new Northern Ireland administration actually be made to work. “Barroso got the serious business out of the way with an announcement of a task force to secure European funding for reconciliation in Northern Ireland and a pledge of _683 million in aid” (ibid.). Read between the lines. Northern Ireland, having suffered long as the victim of sectarian violence, is in drastic need of funds to aid its economy—and the EU is only too willing to help! The Catholic South in the island of Ireland is already a willing member of the European Union, and as a result of the EU’s largesse, sports one of the most vibrant economies within the Union. Sinn Fein knows it has a willing sponsor in the EU and a ready supporter in the Vatican. It will now have a determination to bide its time until the main thorn in its flesh, the aging Protestant Paisley, fades from the scene. Northern Ireland is simply in process of falling into the EU maw. And that is a strategic disaster for the United Kingdom! By his capitulation to Sinn Fein in its end game of terror in Northern Ireland, Ian Paisley may well have aided the very process that the current archbishop of Canterbury seems so inclined to hasten: the yielding to Rome of the British Isles in matters of both religion and politics, and the resultant subsuming of the British royal crown by the very popery that Paisley has spent his whole political and religious career resisting. Since Britain fled the clutch of Rome under King Henry viii, the sceptered isle, long known in Roman Catholic tradition as “Mary’s Dowry,” has been lusted over by a Vatican that has intrigued through the centuries for its return to the Catholic fold. Bible prophecy strongly indicates that currently unfolding events in Northern Ireland are only serving to hasten the day when Mary’s Dowry will be handed back to the vicar of Rome. Request your own copy, free of charge, of The United States and Britain in Prophecy for more detail on this unfolding story.